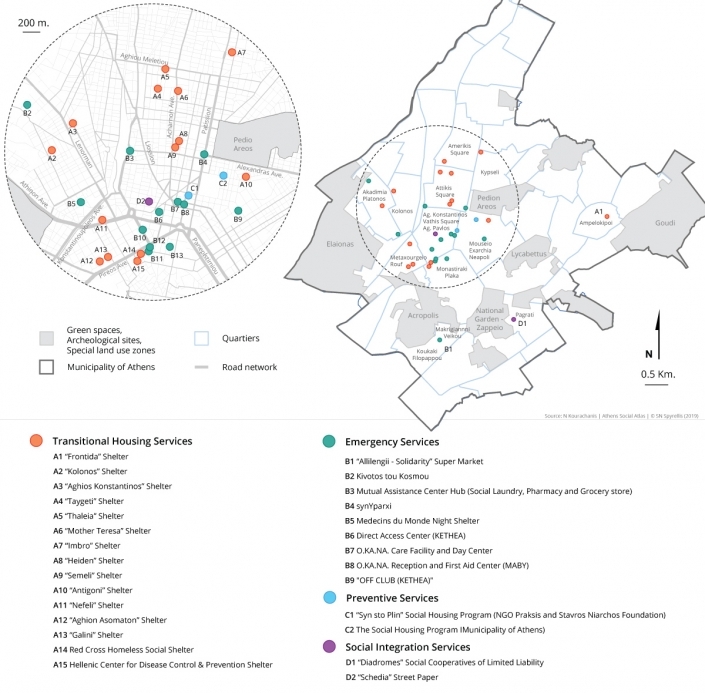 The aim of this entry is the mapping of the basic homelessness services in Athens. The capital of the country seems to bear the predominant burden of this social problem (Δημουλάς, κ.α. 2018: 5). In brief, four different forms of housing support could be distinguished in the international literature, focusing on different time points of homelessness. These are preventive services, emergency services, transitional housing services and social integration services (Kourachanis, 2015: 114). Social policies for homeless people in Greece have long been characterized by the existence of residuality, fragmentation, discontinuity, lack of centrally controlled co-ordination, and the dominance of a philanthropic managerial spirit (Arapoglou, 2004). Emergency services dominated as a form of social support in this socially inadequate context (Κουραχάνης, 2017). During the economic crisis, a series of adverse developments  [see Arapoglou and Gounis, (2017), Κουραχάνης, (2017)], offer strong suspicion that the current situation is deteriorating considerably, something that is primarily reflected in the case of Athens (Arapoglou and Gounis, 2015). This situation makes the need for extended action imperative in order to deal with those developments. In contrast to this necessity, the aggravation of social problems over the last eight years has been accompanied by extensive cuts in the social protection system due to austerity policies. As a result of this condition, there is an inherent contradiction: while there are serious indications of a rise in homelessness, social policies are weakened or oriented towards an exclusive management of publicly visible phenomena (Κουραχάνης, 2017). More specifically, the residual pre-crisis framework of preventive policies became weaker. Transitional housing policies are also characterized by an outdated and quantitatively inadequate set of social hostels, which is not effectively linked to other social services. A structured range of social integration policies still does not exist. This is happening at a time when social integration policies are broadly deregulated. The only aspect where certain mobility is observed is that of the urgent management of the problem. These are the so-called “emergency services”. The crisis thus consolidates a residual social intervention model focusing on emergency management, which, in its usual form, is being funded by European funds or by private initiatives and implemented by civil society. The central government is limited to coordinating or supervising these actions (Κουραχάνης, 2018). The emphasis of the above social services is concentrated in Athens. The city of Athens includes the widest range of homelessness structures. The main features of social policies for the homeless in times of economic crisis and how these are embodied in actions taking place in the city of Athens are listed below. A summary table categorized according to the social services offered to homeless people in Athens is listed at the end of the text. 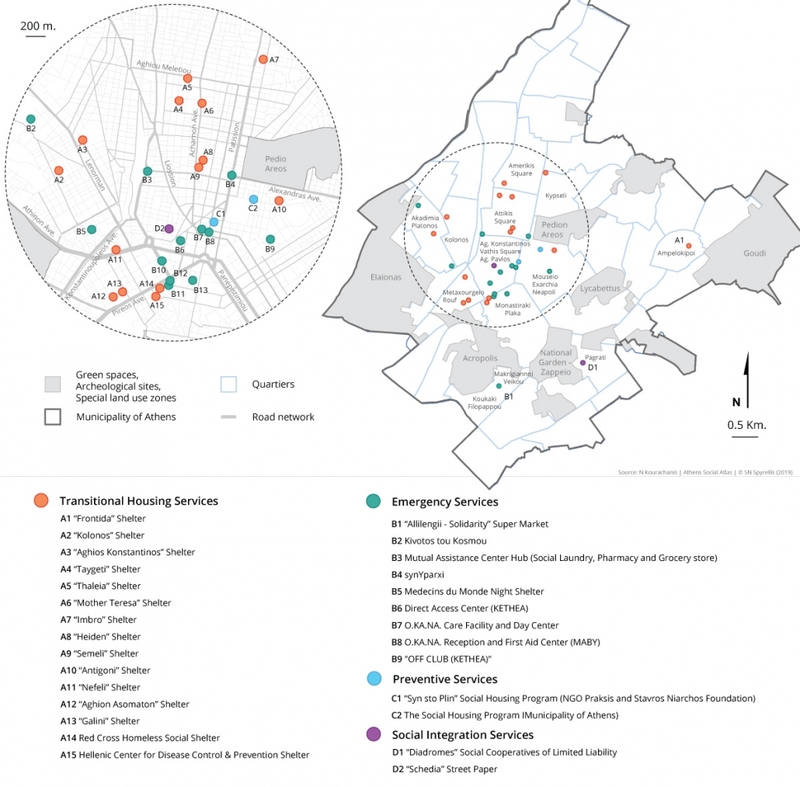 These services aim to prevent homelessness. Such measures may be housing allowances or programs to combat energy poverty (subsidy of electricity and heating bills). This category also includes social support and empowerment services for those experiencing housing insecurity in connection with their stay in the residence. Moreover, this stage includes mediation services to prevent evictions or the existence of an institutional framework for the protection of the primary residence from real estate auctions. In Greece, preventive policies do not seem to offer a social protection framework proportionate to the present size of the problem. The “Housing and Reintegration” program was an exception to this mild prevention policy landscape (βλ. σχετικά Kourachanis, 2017, Δημουλάς, κ.α. 2017). Beneficiaries of this program included households that were evicted. In contrast to this, the dominant tendency in the years of the crisis is that bodies of protection and promotion of workers’ housing became abolished. Furthermore, any legislative measures designed to protect the home are tightened. The abolition of the OEK (Worker’s Housing Organisation, Law 4046/2012), to reduce the economic burden of employers, is certainly reducing the prospects of maintaining decent living conditions for the lower socio-economic strata. Additionally, the only initiative to protect property owners could be considered Law 3869/2010, also known as the “Katseli Law”. The recent revision of the Katseli Law Framework is likely to have an impact on homelessness. In Athens, homelessness prevention policies are scarce. Some of the most important are the Municipality of Athens Social Housing Program and the ‘Syn sto Plin’ Program of the NGO Praksis. The Social Housing Program of the Municipality of Athens, with the support of the Hatzikosta Foundation, offers housing services to residents of Athens who face housing problems. The aim of the program is to accommodate, in suitable apartments, families with children, the elderly, pregnant women and generally persons who are homeless or at risk of being homeless. “Syn sto Plin Program”, with the support of the Stavros Niarchos Foundation, focuses on providing financial and counseling support to individuals and families who are experiencing homelessness or at risk of losing their homes. A direct aim of the program is to preserve the economic and housing autonomy of each family. Emergency services target people who are unable to meet their immediate living and housing needs. For this reason, these services require immediate administrative reflexes and a good network of coordination and complementarity between implementing bodies. The austerity policies implemented in recent years in Europe favor the development of services with these characteristics. In particular, such actions may be traditional forms of protection, such as night shelters. In addition, in today’s reality the development of homeless day centers is observed. These centers constitute for homeless people an important point of access to benefits in kind such as food, clothing, medicines, personal hygiene products, blankets, etc. Finally, these services include traditional religious and philanthropic practices for the most deprived, such as soup kitchens. In Greece, the greatest mobilization for supporting the homeless in the years of the crisis is noticed in emergency services. These services are primarily targeted at the homeless population who has lost their home. They focus on tackling the most extreme and publicly visible homelessness (e.g. homeless people living on the street). It is understood that these services are designed to meet the most basic human needs. The provision of such services is mainly done by Civil Society. The financial resources of the actions derive from Community funds, from voluntary contributions from citizens or charities or from sponsorships by private companies. Even in cases where the design or organization of such structures is left to the municipalities, the implementation of policies is usually entrusted to NGOs. In Athens, typical examples of such interventions are KYADA, Night Shelter, as well as the Daily Homeless Reception Center of the Municipality of Athens. According to its official website, KYADA started its operation in 2005 under the name Open Homeless Reception Center of the Municipality of Athens. Its main task was the provision of care for the homeless people of the city through the operation of soup kitchens and the ability to join accommodation programs. In 2010, it was renamed as the Municipality of Athens Reception and Solidarity Center. KYADA has over 9,000 beneficiaries, a figure that accounts for about 25,000 people benefiting, of which about half are families with children. The Night Shelter of the Municipality of Athens is being operated in collaboration with the NGO Medicines du Monde. It is a structure of direct accommodation that operates only during the night and covers emergency housing needs of those living on the streets. In particular, it provides overnight accommodation, personal care and hygiene, psychosocial support and mediation with housing, food, psychological support, legal assistance, counseling, health, welfare and social reintegration services. Finally, the Daily Homeless Reception Center of the Municipality of Athens is being operated in cooperation with NGO Praksis. It offers psychosocial support, primary health care, personal care and hygiene, as well as mediation of the beneficiaries with housing, food, psychological support, legal assistance, counseling services, etc. Transitional housing services are differentiated from those of emergency, as they are oriented towards the housing reintegration of the homeless. Forms of transitional hospitality can be social hostels or social apartments along with rent, water bills, heating or electricity bills subsidies. At the same time, an individualized approach to social services is imperative in combating the particular problems faced by every homeless. To serve this purpose, a series of interventions are being undertaken to ensure successful autonomous living. Such services are those that support the treatment of mental health problems and substance addictions, the development of household and budget management skills, and the treatment of possible financial debts. It may also include interventions that seek to link these services to training and employment policies. In Greece, transitional housing structures can be considered quantitatively and qualitatively inadequate, a fact resulting from recent research efforts (Κουραχάνης, 2017). This is primarily an obsolete network of social hostels. These structures lack any integration philosophy as they do not link the accommodation they offer with social integration actions. They are therefore disconnected from a wider network of social services, such as employment programs, which could enhance the chances of social inclusion. The operation of Hostels, without wider integration policies, should be considered a socially deadlocked action (Kourachanis 2015). Most of the country’s social hostels operate in Athens. Two of the most well-known social hostels in Athens are the Red Cross Social Hostel and the Karea Hostel, which is supervised by the EKKA. The Red Cross Hostel offers accommodation and hospitality services, food, psychosocial support, mainly to families. Karea’s hostel offers shelter and home care, people with disrupted family relationships, the elderly and other vulnerable social groups. Housing integration services should not be exhausted in a one-dimensional grid of policies with return to housing as an end in itself. Instead, at this stage, effort is required to solve most of the causes that led to the loss of housing. A substantial integration project involves interventions with wider implications that ensure the homeless’ access to benefits in kind and income. Such policies could include providing supportive employment, offering psychosocial support services, social services mediation to address the particular social problems of the homeless, education and training actions aimed at enhancing their professional skills. In Greece, social integration initiatives for homeless people are scarce, including mainly actions by NGOs. Indicative is the paper recycling program or the sale of a street magazine by the homeless. These actions provide an elementary income for these people and also increase self-esteem and the possibility of reintegration. However, to date, no attempt has been made to generalize those initiatives at central level. The consequence of this situation is their extremely limited effectiveness. In Athens, arguably, the most important action to encourage the social integration of homeless people is the street magazine “Shedia” issued by NGO Diogenis. Shedia, based on the practices of street magazines worldwide, is distributed by homeless and indigent citizens. The aim of the magazine is to provide them with economic and social support through daily activities. Homelessness support services in Athens are the main body of social policies for homeless people in Greece and largely reflect their structural characteristics. In Greece, the crisis has evidently weakened even the limited means of intervention that existed. Preventive policies from weak become meager. Transitional housing policies are governed by a “shelter-based” philosophy, without being linked to wider social support services. Social inclusion policies are limited and de facto inadequate in the general deterioration of poverty and social exclusion. High mobilisation is found predominantly in emergency policies. However, this is realised with specific characteristics and orientations that encourage a model of social management centered on non-state initiatives. At a time when housing insecurity increases, housing support services establish a model of residual social management for those who end up on the streets. According to Eurostat data (2018), in the years of the crisis, a number of indicators have been seriously deteriorating, influencing homelessness in Greece. For example, the risk of poverty and social exclusion from 27.7% in 2010 rose to 35.7% in 2016, unemployment rates from 7.8% in 2008 to 24.9% in 2015, long-term unemployment rates from 3.9% in 2008 to 18.2% in 2015, material deprivation rates from 21.8% in 2008 to 40.7% in 2016, housing mortgage rates for poor households from 18.1% in 2010 to 40, 9% in 2016. At the same time, public housing support expenditure declined from 0.38% in 2007 to 0.01% in 2013. Arapoglou V. P. (2004), “The Governance of Homelessness in Greece: Discourse and Power in the Study of Philanthropic Networks”, Critical Social Policy, 24(1):102-126. Arapoglou V. and Gounis K. (2015), “Poverty and Homelessness in Athens: Governance and the Rise of an Emergency Model of Social Crisis Management”, GreeSE Paper No. 90, Hellenic Observatory Papers on Greece and Southern East Europe, LSE. Arapoglou, V. and Gounis, K. (2017), Contested Landscapes of Poverty and Homelessness in Southern Europe. Reflections from Athens, London: Palgrave Macmillan. Δημουλάς, Κ., Αράπογλου, Β., Γκούνης, Κ. και Ρίτσαρντσον, Κ. (2018), «Πιλοτική Καταγραφή Αστέγων στους Δήμους Αθηναίων, Θεσσαλονίκης, Πειραιώς, Ηρακλείου, Ιωαννίνων, Νέας Ιωνίας και Τρικκαίων», Αθήνα: Πάντειο Πανεπιστήμιο. Δημουλάς, Κ., Κουραχάνης, Ν. και Καζάνη, Α. (2017), Αξιολόγηση του Προγράμματος «Στέγαση και Επανένταξη», Αθήνα: ΕΙΕΑΔ. Kourachanis N., (2015), “Confronting Homelessness in Greece during at time of Crisis”, Social Cohesion and Development, 10(2):113-129. Kourachanis N. (2017), “Homelessness Policies in Crisis Greece: The Case of Housing and Reintegration Program”, European Journal of Homelessness, 11(1):59-80. Κουραχάνης, Ν. (2017), Κοινωνικές Πολιτικές Στέγασης. Η Ελληνική Υπολειμματική Προσέγγιση, Αθήνα: Παπαζήση. Κουραχάνης, Ν. (2018), «Κοινωνικές Πολιτικές Στέγης στην Ελλάδα της Κρίσης» στο Κουζής Γ. και Δημουλάς Κ. (Επιμ. ), Κρίση, Κοινωνική Πολιτική, Κοινωνικά Αδιέξοδα και Λύσεις, Επιστημονική Εταιρεία Κοινωνικής Πολιτικής, Αθήνα: Τόπος.